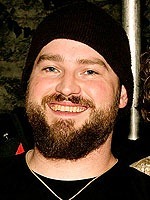 I received an e-mail yesterday afternoon, about a benefit concert Zac Brown Band will be hosting in Atlanta, Ga., on Oct. 30, at 7:30 p.m., at the Fox Theatre. The show will benefit the historic Georgia Theatre in Athens, Ga., which was destroyed by a fire this past summer. All proceeds will go to rebuilding the theatre. Below is a press release ZBB had up about the event on their web site. 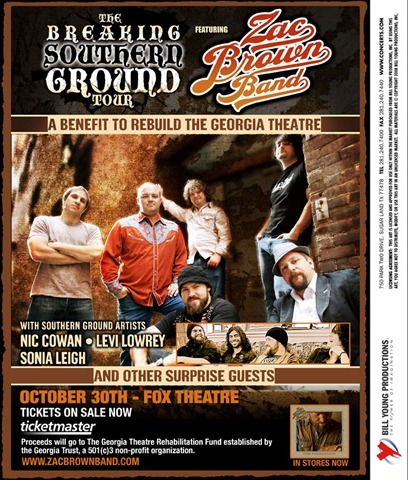 Amid a schedule packed with arenas and amphitheatres, Zac Brown Band will make a hometown stop on their "Breaking Southern Ground" tour this fall for a Georgia Theatre benefit show at the Fox Theatre in Atlanta, Georgia on October 30. Proceeds from the show will go to rebuild the dearly beloved and recently decommissioned Georgia Theatre. Prior to a devastating fire earlier this year, the movie-palace-turned-music-club hosted performances by all the local legends including R.E.M., B-52s, Drive-By Truckers and Widespread Panic. "The Zac Brown Band are showing their incredible generosity and their love for the Athens music scene by hosting this benefit,” says Wilmot Greene, Georgia Theatre owner. “The presence of the Theatre in Athens has allowed bands to find an important early audience that helps to bring bigger success later. That’s a big part of the tradition of the Theatre and is an important aspect of why it needs to be rebuilt. 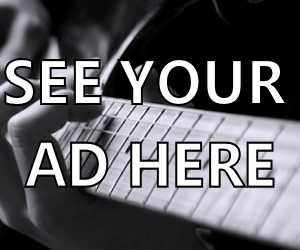 This concert will be a huge help." While the Zac Brown Band are hosting the show and mark the first confirmed performers on the bill, the concert hopes to host a variety other well-known and successful acts who also came up through this legendary local venue. Tickets will cost $100 and are available via Ticketmaster. Presented by Outback Concerts, proceeds of the show will go directly to The Georgia Theatre Rehabilitation Fund, handled by The Georgia Trust for Historic Preservation. 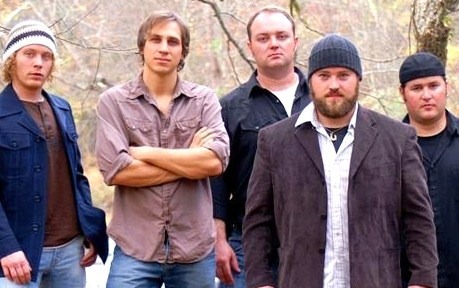 Here’s a little video of a Zac Brown Band interview, and a little of their music – of course. It’s Monday already. Need to think about getting to the office. Hope you guys have a great week. I’ll talk to you real soon! Kid Rock Releases New Song "Tennessee Mountain Top"